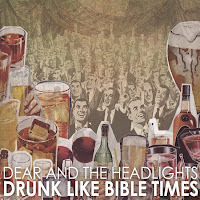 Atlas and the Anchor: Dear And The Headlights - "Drunk Like Bible Times"
Dear And The Headlights - "Drunk Like Bible Times"
After emerging like a phoenix from...Phoenix last year with their debut, "Small Steps, Heavy Hooves", Dear And The Headlights have just released their second album on Equal Vision Records, titled, "Drunk Like Bible Times". Much like The Counting Crows in their prime, they create dusty, piano laden alt. country-indie rock with great appeal. Fans of Okkervil River and Bright Eyes will find comfort in singer, Ian Metzger's wavering, almost painfully emotional soft/loud vocal style. Five years in the making, the songs on the last release were much more lived in and demo-ed to death before finding their way on the album. The new batch of songs were written after touring and fully coming together as a band, with an emphasis on capturing the energy of their live show. Not much is different between the two albums, which is a great thing. Why try to fix something that is not broken? And it shows on tracks like, "Bad News" with its instantly catchy sing-along chorus and driving guitar line. And the emotionally charged "Talk About" which doesn't so much talk as scream about the way journalists try to interpret or over analyze the lyrics to his songs. DATH prefers to let their music speak for itself and for the fan to interpret the lyrics and have an emotional connection to call their own. So raise your glass and sing along to one of this years best releases!